Неподалёку от авиабазы Баграм в Афганистане расположена одна из самых засекреченных тюрем США. Здесь содаржатся и не-афганцы. За колючей проволокой ограждения они не видны никому, и их участь едва ли не тяжелее, чем узников Гуантанамо. Что называется, учитесь свободе слова, дорогие гости, или демократия на марше. [AND IN THE ORIGINAL]Sometimes they stopped eating to protest unclean drinking water. Other times they stopped eating because their comrades were placed in segregated housing. Still other times they stopped eating out of dissatisfaction with their access to the International Committee of the Red Cross (ICRC), their only source of connection to their families and the outside world. 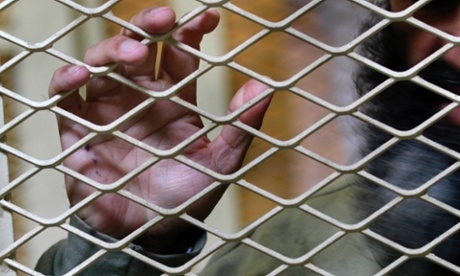 Without any visibility beyond the walls of their prison, non-Afghan detainees that the US holds in almost complete secrecy in Afghanistan have engaged in hunger strikes, the Guardian has confirmed. The hunger strikes are reminiscent, on smaller scale, of those at Guantánamo Bay that seized the world's attention last year.